Gastroparesis is a disorder in which food moves through the stomach much slower than normal. The disease affects more than 10 million Americans and symptoms include chronic nausea, vomiting and abdominal pain. In severe cases, a permanent feeding tube may be required to ensure adequate nutrition; a medical implant to stimulate the digestive system can also be provided for patients with profoundly severe, drug-resistant symptoms. 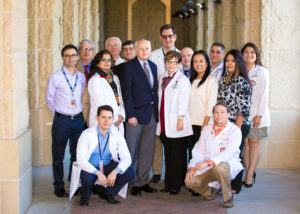 With the funding, the TTUHSC El Paso team will enroll patients who are diagnosed with or are presenting symptoms of gastroparesis to test new pharmacological agents that may reduce the severity and frequency of their gastrointestinal problems. The team will also examine the effectiveness of a novel diagnostic procedure for the condition — utilizing an endoscopic ultrasound to obtain biopsy samples of smooth muscle from the stomach. This technique was invented by the TTUHSC El Paso team, and if successful, could replace an invasive surgical procedure currently used in patients with gastroparesis. Individuals with gastroparesis who opt to participate in the TTUHSC El Paso studies will receive free health care related to the disorder. This includes access to diagnostic tests like endoscopies and ingestible capsules that assess the digestive system, as well as the latest FDA-approved pharmacological treatment options, some of which are still investigational. Drs. 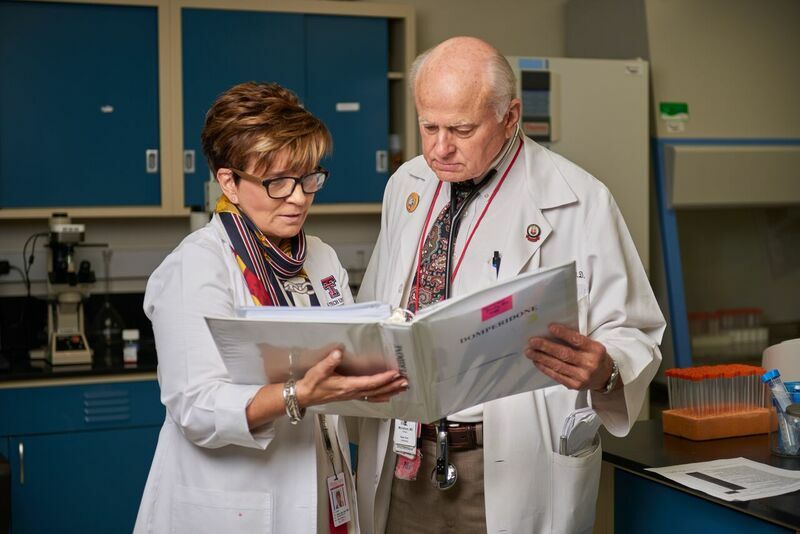 McCallum and Sarosiek are studying the disease as part of their membership in the Gastroparesis Clinical Research Consortium (GpCRC), a prestigious national partnership that focuses on the cause of gastroparesis and therapies for the disorder. Membership is limited to top-level institutions researching the disease and includes Baylor College of Medicine, Massachusetts General Hospital, the Mayo Clinic, Johns Hopkins University, as well as TTUHSC El Paso. Photo by Raul De La Cruz / TTUHSC El Paso. Additional TTUHSC El Paso GpCRC collaborators participating in the project include surgeon Brian Davis, M.D., endocrinologist Tamis Bright, M.D., radiologist Jesus Diaz, M.D., biomedical scientist Olof Sundin, Ph.D., and pathologist Alireza Torabi, M.D., Ph.D. Some TTUHSC El Paso gastroparesis-related studies rely on scientific concepts that were created in close interaction with Daniel Terreros, M.D, Ph.D., Munmun Chattopadhyay, Ph.D., and Dolgor Baatar, M.D, Ph.D.
Clinical Trial Director Sean Connery; research coordinators Natalia Vega, Yvette Gomez, Ben Alvarado and Kenny Dominquez; secretary Andrea Rios; GI research scientist Mohammad Bashashati, M.D. ; and Associate Chair for Research Jerzy Sarosiek, M.D, Ph.D., will also assist throughout the grant.